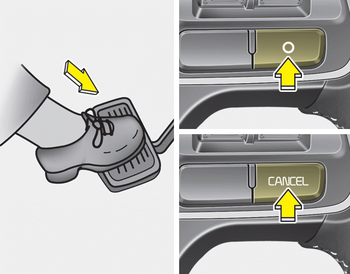 The smart cruise control is temporarily canceled when the brake pedal is depressed or the CANCEL button is pressed. The speed and vehicle to vehicle distance indicator on the cluster is disappeared and the CRUISE indicator is illuminated continuously. The driver's door is opened. The shift lever is shifted to N (Neutral), R (Reverse) or P (Paking). The EPB (electronic parking brake) is applied. The ESC, ABS or TCS is operating. The ESC is turned off. The sensor or the cover is dirty or blocked with foreign matter. The accelerator pedal is continuously depressed for long time. The engine speed is in dangerous range. The SCC system has malfunctioned. Each of these actions will cancel the smart cruise control operation. (the set speed and vehicle to vehicle distance on the LCD display will go off.) In a condition the smart cruise control is cancelled automatically, the smart cruise control will not resume even though the RES+ or SETlever is moved. If the smart cruise control is cancelled by other than the reasons mentioned, we recommend have the system checked by an authorized Kia dealer. If the system is automatically cancelled, the warning chime will sound and a message (“Smart Cruise Control canceled”) will appear for a few seconds. You must adjust the vehicle speed by depressing the accelerator or brake pedal according to the road condition ahead and driving condition. Always check the road conditions. Do not rely on the warning chime.